Propagation is the process of continually fragmenting and growing out coral colonies to generate large amounts of clonal fragments within the nursery. Traditional techniques can also be considered ‘macro-fragmentation’ as larger pieces of coral colonies are generally fragmented in propagation. 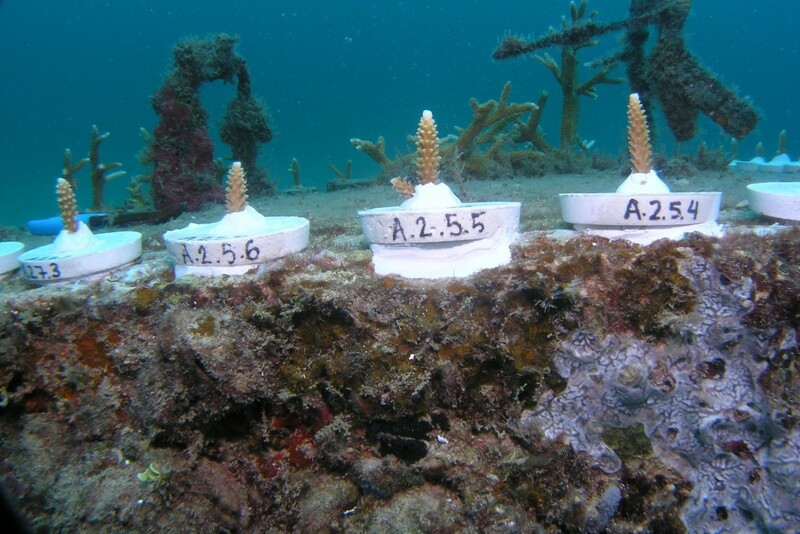 Genotypes of corals in the nursery should continue to be tracked so that genetic diversity can be maintained and genotypes can be fragmented separately. This can be done by placing different genotypes on separate blocks, floating structures, or within separate aquaria, or by maintaining a detailed map of the nursery. Some form of labeling should occur so that nursery personnel do not confuse or mix up genotypes. 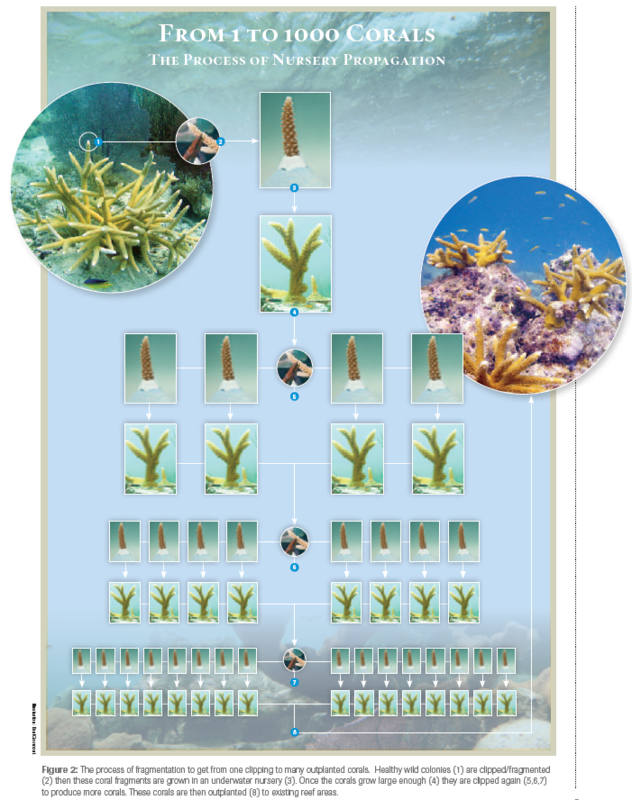 Below is a schematic describing the process of propagating corals to generate thousands of coral fragments that can be used for population enhancement. Corals raised in nurseries are often clustered together or in high density arrangements, which can lead to disease outbreaks. Thus, the management of disease is an important activity for nursery operations. Nursery designs that provide increased spacing between corals may help minimize the spread of disease between colonies. If an outbreak occurs, diseased colonies can be treated by isolating the diseased coral within a quarantine area, removing diseased colonies, or utilizing an epoxy ring over the disease margin. These suggestions do not guarantee disease will stop spreading in a nursery, however, and should only be done if corals can be safely pruned without additional harm being done. Disease outbreaks typically occur during warmer seasons when corals are already stressed; thus, clipping stressed corals may do more harm than leaving the coral be. Disease protocols should therefore be dependent on individual coral nursery operations, permits, coral species, and the specific coral disease. Coral pucks labeled with unique identification codes after pruning. © Elizabeth Goergen, NOVA Southeastern University. 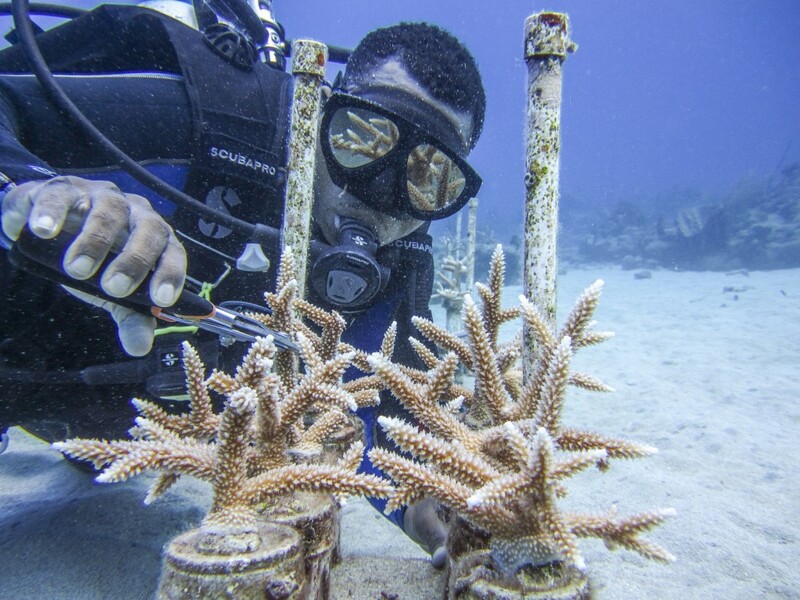 When handling disease corals, disposable gloves should be worn, removed after use, and thrown away before coming into contact with other coral colonies. In land-based nurseries, any tools or equipment in contact with diseased colonies should be rinsed in a 5% bleach solution followed by fresh water before coming into contact with other colonies.